Fiji is the place we dream of on a Monday while stuck in traffic or suffering through that weekly business meeting again. Fiji is planted between New Zealand and Hawaii with well over 332 islands. Fiji offers such a wide array of adventures that it’s no wonder that the resorts are considered a getaway by themselves. We’ve collected our top 11 Tropical Resorts in Fiji so your next getaway will be the best one yet! Located in Savusavu is this adults-only resort complete with ocean views, lush gardens, golfing, a spa and access to kayaking and horseback riding. Enjoy the view and sip something cold here. You’re bound to come home feeling rejuvenated. A former coconut plantation filled with 25 different bures. From oceanfront and to point reef bures and plenty of privacy this is the perfect getaway for those looking to unplug with no phones or tv. What a better way to get back to basics. An intimate and private couples getaway there will never be more than 12 couples at one time. Home to Rainbow Reef and an abundance of scuba diving sites you and your special someone will connect on a whole new level. Be sure to explore the World Heritage Rainforest Parks as well for even more beauty and once in a lifetime sights. Also located in Savusavu, Koro Sun is an all-inclusive resort with a beautiful view of the surrounding rainforest. This is the perfect getaway for nature lovers to explore the natural beauty while still enjoying the amenities of Koro Sun such as a pool, spa and fitness center. Another option for an adults only resort, Royal Davui is the perfect choice for privacy and honeymooners to escape the hustle of life. Royal Davui is also known as a perfect spot for destination weddings. As a bonus Royal Davui has many great options for experiencing true Fiji diving. This unique resort is welcoming to everyone including families with children. Warm sandy beaches, pools to splash in and 10 miles from the airport it is the perfect family getaway for everyone to relax and slowdown from the rush of life. With plenty of choices for exploring, dining and soaking up some sun you won’t have a moment to stress! The absolutely perfect option for scuba diving and snorkeling these bures make up the perfect resort for water lovers. If scuba diving and snorkeling aren’t for you don’t worry, there is still plenty for you like the spa, pool, tennis courts and golfing which only make up a fraction of the activities offered to you. Turtle Island is the perfect pick for foodies and romantics alike. With the maximum amount of guests only 28, you will never be overcrowded here. The majority of the fruits and veggies are grown right on the island plus fresh seafood the eating is good and the living is easy. Enjoy the sunset in this beautiful paradise today! Likuliku means “calm waters”, and this resort lives up to its name with over the water bures. Likuliku Lagoon resort is the best choice for those wanting to learn and embrace the local culture while remaining in a resort setting and enjoy the many amenities offered to you such as the spa and fitness center. Another great choice for a those traveling with children. This beautiful resort is filled with amazing dinning options, nightlife, lush rainforests and vibrant coral reefs that are all available for exploring. Your vacation will be one for the entire family to remember for years to come. A getaway made with couples in mind this resort offers a front row seat to see the tropical fish via snorkeling and plenty of romantic options for relaxing and dining. Tokoriki is perfect to reconnect and refresh. 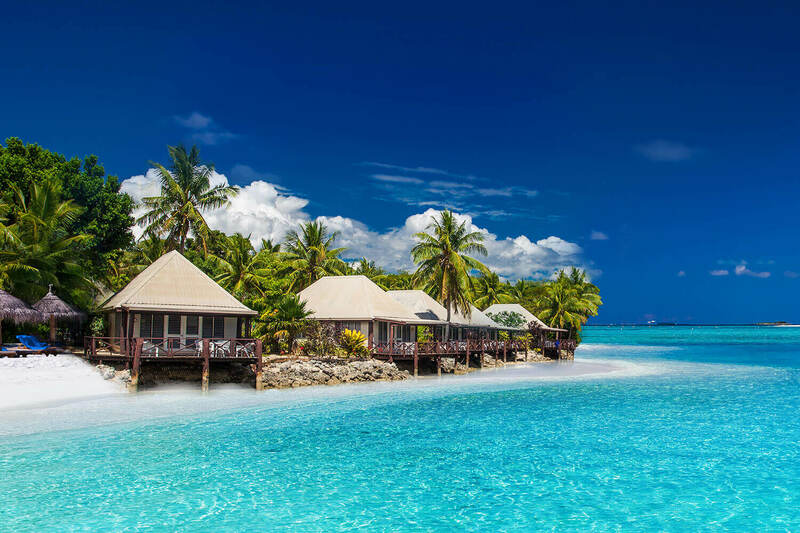 No matter where you find yourself in Fiji, we can promise that you will find yourself surrounded by natural beauty and the sound of the crystal blue water washing onto the warm sandy beaches.